As it is already sealed and in use it can no longer be used as an envelope for anything else. There is also a personalised address typed into the bottom left-hand corner, therefore restricting who it can be sent by. Francois Lötter, my grandfather, had a love for collecting coins. He would use envelopes as a means of organising these coins into the countries they were from. 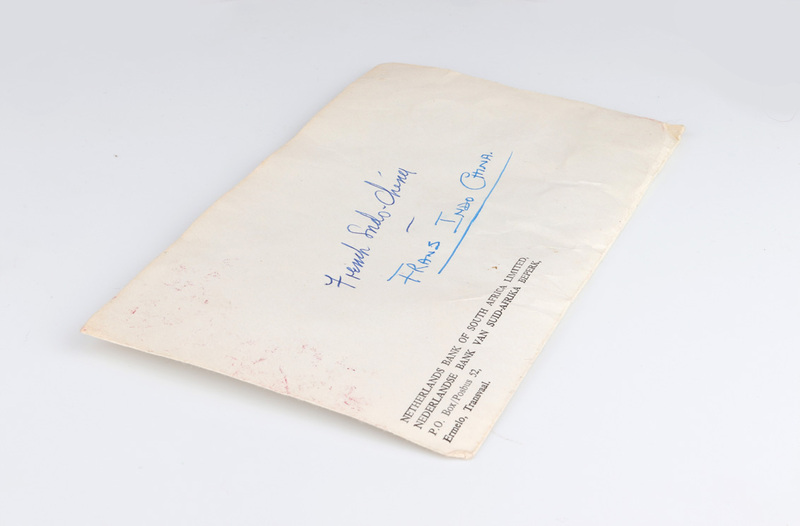 He would have obtained this particular envelope from the Netherlands Bank of South Africa in Ermelo, and then used it to sort out the coins from French Indochina. 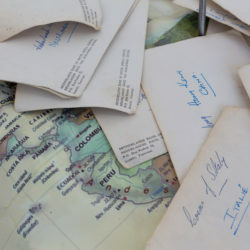 Three things listed on the envelope no longer exist; French Indochina, the Transvaal and the Netherlands Bank of South Africa. They are all now obsolete, having been changed and given new names. While much has changed, it is interesting that these places existed during my grandfather’s lifetime. The world has been impacted by the past, yet it is not always easy to refer to something that is intangible. These objects remain as physical traces of a period in time which has already passed. For this project I used a collection of coins I inherited from my grandfather, which I have also added to over the years. I decided to focus on the mobile nature both of the coins and my life. 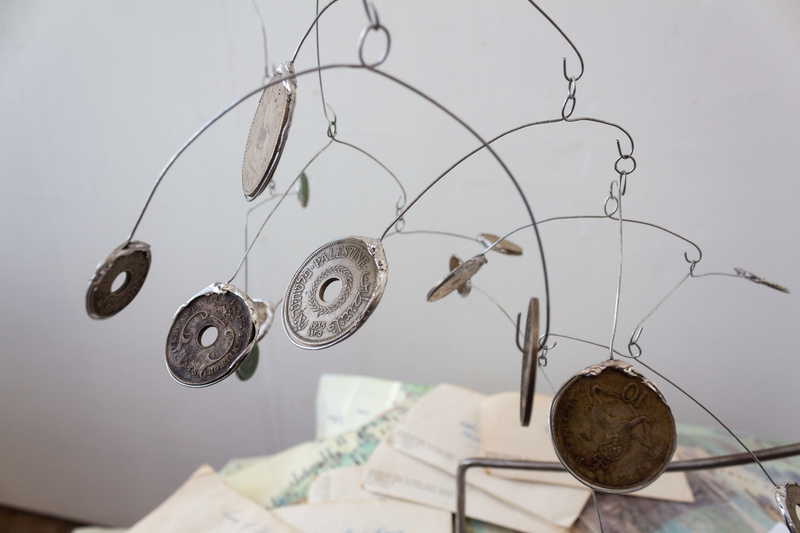 The coins were made to move from place to place, and in my life I have lived in 2 countries, and roughly 20 houses.I used a mobile made up of the coins to portray this movement. 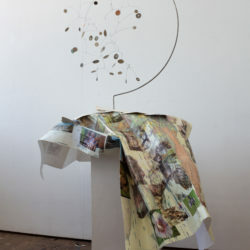 By using a mobile the idea of constant motion is emphasised, as the coins and I will continue to move around. 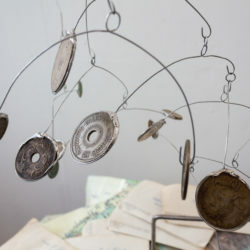 At the base of the mobile is a map which I have personalised with imagery from my life and all the places I have lived. Showing where I come from and where I have been, I am, in a sense, “mapping” out these parts of my life. This placed with the envelopes is supposed to evoke imagery of someone planning to travel again, referencing the idea of constant motion. 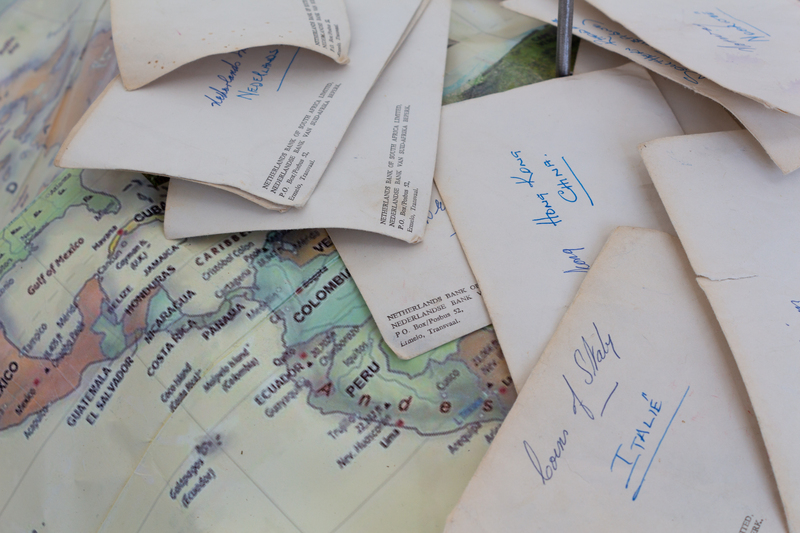 The envelopes scattered on the map, and around the base of the mobile, are my grandfather’s means of curating some of the coins. He organised these into envelopes labelling where they came from. 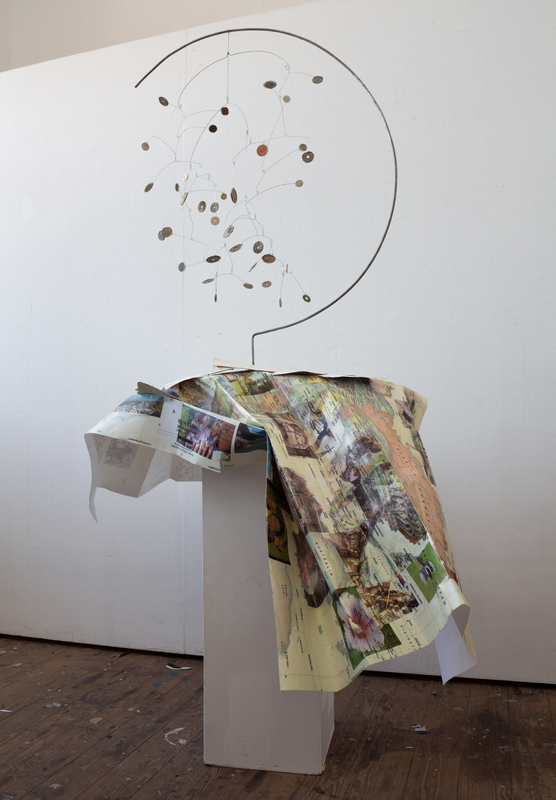 The envelopes again refer to movement, yet they also conceptually linked to the past. Not only were they my grandfather’s and quite aged, they also refer to a system of communication that is outdated. We now use modern technology which is a lot faster. The names of many of the places inscribed on them also no longer exist. This again links to movement, but in terms of change. Everything is constantly changing and in this way the world is constantly in motion. The coins within the envelope would have had to somehow travel to South Africa and then within South Africa until my grandfather then bought them or obtained them in some other manner to become part of his coin collection. Krugerpark.co.za. (2018). History Of Kruger Park | Transvaal Republic | South Africa.... [online] Available at: http://www.krugerpark.co.za/the-transvaal-republic.html [Accessed 4 Oct. 2018]. Nedbank.co.za. (2018). Our History. [online] Available at: https://www.nedbank.co.za/content/nedbank/desktop/gt/en/aboutus/about-nedbank-group/who-we-are/Our-history.html [Accessed 5 Oct. 2018]. Szczepanski, K. (2018). Find out What the French Indochina Was. [online] ThoughtCo. Available at: https://www.thoughtco.com/what-was-french-indochina-195328 [Accessed 4 Oct. 2018].